The miles-long observatories known as LIGO — “cosmic microphones” tuned to the far reaches of the universe, born out of an MIT classroom exercise decades ago — have detected another set of gravitational waves cast off by the violent collision of two black holes, the LIGO scientists revealed in a paper published Thursday. The latest discovery marks the third detection by LIGO in little more than a year and adds to science’s understanding of black holes, mysterious pockets in the universe so dense that no light can escape their gravitational pull, making them invisible to telescopes. It also further affirmed Einstein’s century-old description of how gravity works, including his prediction that any accelerating body with mass — a waving hand, a train leaving a station, or immensely powerful black holes mashing together in a distant corner of the universe — casts off something called gravitational waves, or faint ripples in the curvature of spacetime. Einstein himself wavered on whether gravitational waves existed beyond the math of his own formulas, and he died doubting whether anyone could ever invent a device fine-tuned enough to ever perceive them if they really did exist. Enter LIGO (the Laser Interferometer Gravitational-wave Observatory), initially conceived as a “thought experiment” by MIT physics professor Rainer Weiss half a century ago during his sole semester teaching relativity. Weiss’s quixotic idea ultimately grew from a tabletop model into a set of massive National Science Foundation-backed observatories constructed in Louisiana and Washington, and it spawned an MIT- and Caltech-led collaboration that now includes institutions around the globe. Of the three different mergers of paired, or binary, black holes now observed by LIGO — something never before detected, and even doubted until this by some theorists — this latest collision occurred more than twice as far away in the universe as the previous two. It involved black holes smaller than the first set but bigger than the second. LIGO’s two L-shaped “receivers” boast vacuum-tube arms that run 2.5 miles in each direction and house powerful laser beams that bounce back and forth between nearly flawless floating mirrors. All of that serves as a way to measure gravitational waves that squeeze and stretch those long arms — jostling the mirrors and changing the distance traveled by the laser beams — by a tiny fraction of the width of a proton, in a fraction of a second. The latest detection journeyed to earth across 3 billion light-years, ripples cast off when a pair of black holes about 31.2 and 19.4 times as massive as our own sun orbited each other before slamming together at a significant fraction of the speed of light to form a new black hole roughly 49 times as massive as our sun. 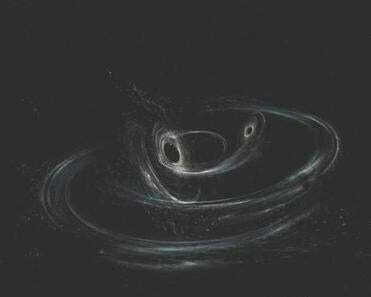 An illustration of two merging black holes. Most of the remaining mass — nearly twice our sun’s worth — cascaded out in a powerful burst of invisible energy: gravitational waves that took 3 billion earth years to reach us, and that passed right on by in a fraction of a second. But not before tweaking the precisely honed observatories in Hanford, Wash., and Livingston, La., 3 milliseconds apart on Jan. 4. The LIGO collaboration spent the next five months parsing the data from that observation and preparing the paper published Thursday in Physical Review Letters . Astronomers have come up with two primary methods for how black holes come to exist in pairs, one suggesting that they are born together — from orbiting stars that explode to form orbiting black holes — and the other that the black holes form separately before their random, fateful encounter. The data from the latest detection, while not conclusive, offers a hint at the latter, suggesting these black holes may have been spinning in different directions as they orbited each other, Vitale said. LIGO’s work is just beginning, added Vitale, who years after he first learned Einstein’s theory finds himself marveling at it in the shower. After all, he said, Einstein conceived of it initially to explain why Mercury moved around the sun in a different way than Isaac Newton’s theory indicated. Without a computer, he devised a theory that has held up even to predict the behavior of phenomena no one had yet imagined, billions of light-years away.